If you want to know why your holdings of physical gold and silver have remained under suppression, it is because both are anathema to paper fiat currencies, and the ones who are in control, the moneychangers, will not tolerate competition against their fiat Ponzi monopoly scheme. Not until the elite bankers lose control of the fiat US "dollar" can you expect to see dramatic price increases for gold and silver, irrespective of any and all fundamentals and more widely recognized efforts of manipulation. How long will that take? No one knows, except a lot longer than most expect, as the time horizon continues to shorten. Months? Years? Unknown and unknowable. The only way the elites can exist is through deceit, hiding behind the scenes but unquestionably in total control, with emphasis on the word "total." If anyone is of the limiting belief that the Rothschilds, moneychangers, bankers, New World Order [NWO] is some kind of conspiracy theory, either take the time and do some studied research on factual events and read several court cases, or simply stay the course for being fleeced and enslaved by unwitting assent. Have you ever wondered why politicians never have the voter's interest at heart during their political careers, and why they become so wealthy in the process? One of the more recent examples is William Jefferson Clinton, former president of the corporate federal government. When he left office as governor of Arkansas, he was almost totally without financial means. If he did not have the governor's mansion for his living quarters, he would not have had a place to live. He did not own, nor could he afford his own house. Today, he is a billionaire. [This is a minor example, but one needs to question how all of these so-called "public servants" become so wealthy during and after leaving office. While prostitution may be considered the oldest profession in the world, we are not so sure how politicians cannot assert a similar status. Pay very close attention to the following quote, attributable to the London Rothschild clan, and remember in the context of all politicians as a distinct class from which there is no opposition to what goes on in government. Those of you reading this fall into the second category, "the great body of people," and yes, many, if not most are "incapable of comprehending the tremendous advantage that capital derives from the system," without attempting to affront anyone. "The few who understand the system, will either be so interested in its profits, or so dependent on its favours that there will be no opposition from that class, while on the other hand, the great body of the people mentally incapable of comprehending the tremendous advantage that capital derives from the system, will bear its burdens without complaint, and perhaps without even suspecting that the system is inimical to their interests." Almost every nation has a central bank [except North Korea, Iran and maybe Syria]. Do people understand money, today? What money?! The only thing that exists and passes for money is debt. The word "debt" has a fixed and legal meaning, and it is an obligation [of money] due to another. Debt cannot be money, yet what everyone considers to be "money" is nothing more than "debt." How can that be? Remember the title of this article pertaining to the NWO, "debt, deceit, and war." If you believe [incorrectly] that debt is money, you have been deceived. Last week, we said the next article would be about the elites and war. There is a "wealth" of information one could uncover via research just on the limited information above. We will shed some light on how "there are no accidents," and how war has been used by the elites to keep nations under their control or suffer dire consequences. The Bank of England was started in 1694 by the moneychangers. It was sanctioned by the government, but it remained as a private bank which could issue "money" created out of nothing. None of the investors who owned the private bank were ever revealed. What A. N. Rothschild learned early on that it was immensely more profitable to loan money to nations as long as the loans were secured by direct taxation. The moneychangers loaned whatever amounts politicians wanted because all their loans were secured by taxes. Has much changed in the past 320 years? Not a thing. Today, actually for the past 100 years, the federal United States has had the Federal Reserve in control of the money supply. The Fed issues as much "money" [it is nothing more than debt owed to the Fed], as politicians want. The country sells bonds [obligations, and obligations by definition are debt], to pay for things that it does not have the political to otherwise raise taxes that the people have to pay, at least directly. Let us bring up once again Rothschild's quote: "Let me issue and control a nation's money and I care not who writes the laws." Who do you think has the control over politicians that are charged with writing the nation's laws? Remember, the moneychangers who are in control of every nation's so-called "money" issue it out of thin air, from nothing. We will comment on that astounding fact later on. "The validity of the public debt of the United States, authorized by law, including debts incurred for payment of pensions and bounties for services in suppressing insurrection or rebellion, shall not be questioned..."
Starting with the Bank of England in 1694, moneychangers were willing to lend "money" which they created out of thin air, as long as the debts were backed by taxes. Well, the 14th Amendment includes section 4 expressly for that purpose. Who do you suppose was responsible for that little insertion, and the 14th Amendment was ratified back in 1868? The moneychangers know exactly what they are doing, and they think in terms of decades, not year-to-year or day-to-day, as most everyone does. Those who do not know their own history would be surprised to find out that the early American colonies prospered by issuing their own scrip, paper money, but the States controlled its purchasing power, and there was no interest to pay anyone. This system was designed to facilitate trade and industry to make products pass easily from producers to consumers. The moneychangers controlling England did not like this, at all. England demanded that the colonies pay her only in gold and silver and told the colonies to stop issuing their own scrip. This took away the Colonies' ability to finance themselves, and it created immediate unemployment. This was the primary reason for the Revolutionary War, to cut ties with George III. Mention should be made that the most profitable of time for the Rothschild moneychangers were periods of war. Wars are expensive for nations and require going into large debt to finance them. Guess who finances the wars?! When President Madison defeated the First Bank of the United States, [a central bank], Nathan Rothschild warned him that defeat of that banking Act would result in war. The War of 1812 was fought for this reason, as retribution by the Rothschild moneychangers not having control over the money supply. Decades later, with no central bank, the moneychangers determined that it was necessary to plunge the United States into war. Lincoln was president. For those who "believe" the party line that the Civil War was fought over slavery, it was not. "I have no purpose, directly or indirectly to interfere with the institution of slavery in the States where it now exists. I believe I have no lawful right to do so, and I have no inclination to do so. My primary objective is to save the Union, and it is not either to save or destroy slavery. If I could save the Union without freeing any slave, I would do it." The Rothschilds made the determination that the nation should be divided over a war. It should be noted that the English Rothschilds financed the North, while the Paris branch of the Rothschilds financed the South. Did it matter to the Rothschilds which side won? Not in the least. The moneychangers have the laws of war written such that the debts of the losing nation will be honored [have to be paid, with interest]. The real reason for the Civil War? The moneychangers wanted a central bank in the US so they could control the money supply. War was one of their primary tools: Deceit, Debt, and War. The financial powers in Europe knew of this plan to divide the United States into federations long before the actual war was declared. Lincoln opposed borrowing money from the Rothschilds at 30% interest to finance the Civil War. He decided to issue U S "Greenback" dollars from the Treasury, at no interest cost. [The backs of the dollars were in green ink.] This was totally unacceptable to the moneychangers. Lincoln was assassinated by a lone gunman on 14 April 1865. In April of 1866, "Congress" passed the Contraction Act. Its only purpose was to retire the circulating interest-free "Greenbacks." This is how the moneychangers work: contract the available money supply that would lead to hard times and a recession. In 1866, there was $50.46 per capita of money in circulation. Over the next 20 years, the moneychangers had reduced the per capita money in circulation to just under $7, a 760% decline in buying power. A bribed "Congress" then passed the Coinage Act of 1873 that ceased the minting of silver dollars. Again, less real money in circulation. "Whoever controls the volume of money in any country is absolute master of all industry and commerce... When you realize that the entire system is easily controlled, one way or another, by a few powerful men at the top, you will not have to be told how periods of inflation and depression originate." Two weeks after making this statement Garfield was assassinated by a lone gunman on 2 July 1881. The Federal Reserve Act was passed on 23 December 1913, sealing the fate of the doomed United States as a Republican form of government. The moneychangers were now in full control of the country as the invisible government. Along with the Federal Reserve Act came the Income Tax Act. Recall that Rothschild demanded his loans to governments be backed by the power of taxation. The interest on the money created out of thin air had to be paid by someone. "It is absurd to say that our country can issue $30 million in bonds and not issue $30 million in currency. Bonds are promises to pay, but one promise fattens the usurers and the other helps the people." Let us say that the US debt is $17,ooo,ooo,ooo,ooo. [$17 trillion]. Because the moneychangers are in control, let us also say, for the sake of example only, that the annual interest on the debt is 5%, or $850,000,000,ooo. [$850 billion] All of that $850 billion goes to the moneychangers as interest for creating money out of thin air. If there were no moneychangers involved, no central bank, and the United States issued it own money, as it is supposed to do under Article 1 section 8 of the Constitution, "Congress shall have the power...To coin Money, regulate the Value thereof, and of foreign Coin, and fix the Standard of Weights and Measures;..." then there would be no interest due on the money issued, no $850 billion to pay out to foreign bankers. President Kennedy was another who understood how the moneychangers controlled this nations money supply. He decided to issue silver certificates by the US government as non-interest bearing money. Kennedy was assassinated by a lone gunman on 22 November 1963. He was succeeded by Lyndon Baines Johnson. One of President Johnson's first official acts was to cancel the issuance of Kennedy's silver certificates. Then there was Ronald Reagan. He promised to reduce the size of the federal government, thus reducing the cost of government. There was an attempted assassination on Ronald Reagan by a lone gunman on March 30, 1981. When Reagan recovered and went back to work, he embarked upon one of the largest expansions [and costs] of the federal government in history. These are some of the more notable events in the financial history of the United States, but they are dwarfed by the countless number of events brought about by the invisible government that is in total control of all politicians. Will the government ban the ownership of gold and silver, or at the very least, demand to know the full identity and amount held by individuals? Perhaps, at some point. Even if governments do not, there will come a point in time when buying any physical gold or silver simply is not possible without express permission. Create your own scenario as to what can happen. The point is, this is the time to be acquiring as much physical metal as possible as a means of financial self-preservation, even wealth accumulation. A read of the paper markets, charts, show nothing immediate that would change the current downward movement of price. One important premise that everyone needs to be aware of is that Anything Can Happen. We mention this because one aspect of that axiom is while nothing may be apparent on the charts, it does not mean that one day the price of gold and silver can increase by some large multiple overnight. Anyone who thinks this cannot or may not happen is laboring under the false assumption that they know what the market can do at any given moment. Just something of which to always be aware. There are no concrete indications that gold is about to break one way or the other from its current TR, [Trading Range]. One thing that can be said of gold, over the past few years, there have been no sustained upside rallies that have led to a change of trend. 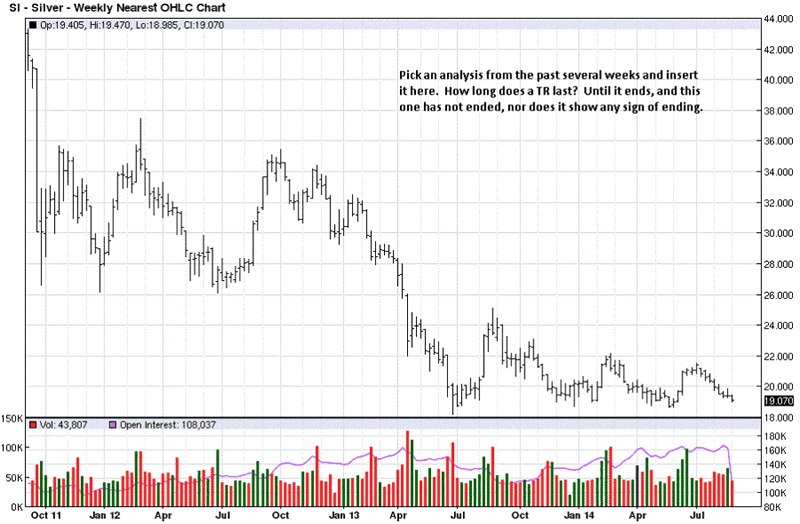 The weekly chart bears that out. There is a smaller down channel within a larger down channel, and neither are indicating a change that would lead to an upside breakout. 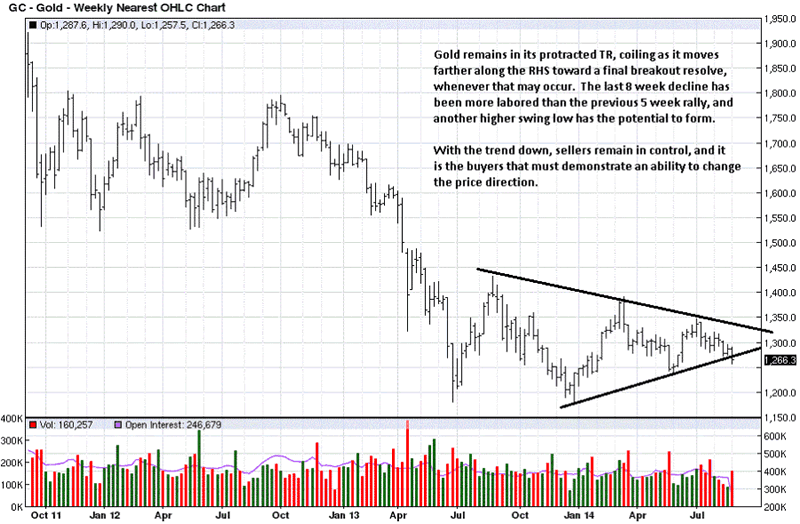 Price is nearer to the lower level of each channel, and that usually indicates a lack of strength. Attention is drawn to the high volume down bar of 2 September, 4th from the end. There has been no downside follow-through. Each of the next day's closing price is above that day's low close. Closings are clustering, indicating a resting spell before continuing lower, or a change for price to rally. Additionally, the bars for the week have been overlapping, and this is a sign if balance where sellers are supposed to be in control. These are observations that need to be confirmed by future market activity to validate the next direction price may take. The fact that the downward pressure in volume has not resulted in additional weakness bears watching. Ennui can best describe weekly silver. Not much of any significance can be said about this market. From a long side for futures trading, there is nothing to offer. 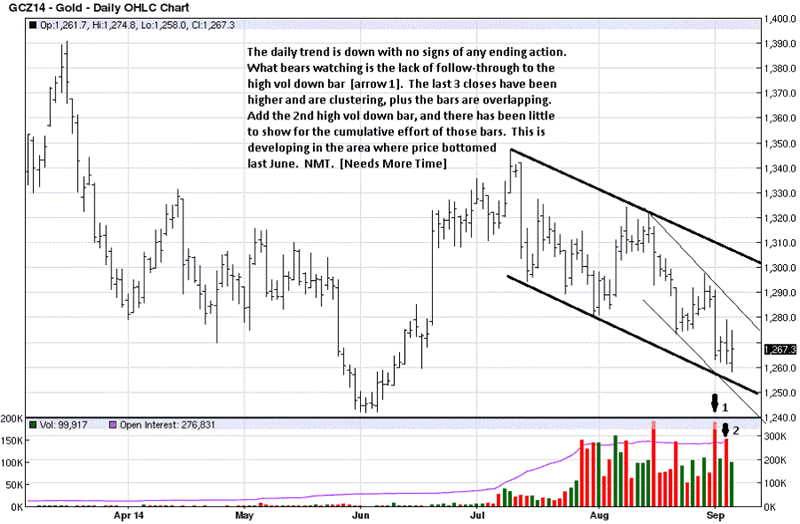 Daily silver is similar to gold in the lack of downside follow-through from Tuesday's sharp decline on high volume. We always say to pay attention to high volume bars because the volume is almost always the result of smart money taking action. It could be in the form of short-covering, even some net buying. The high volume at/near a low, and price is at an area of support from last June, is not a sign of smart money selling. Smart money sells near high areas, not near low areas. It is just common sense. 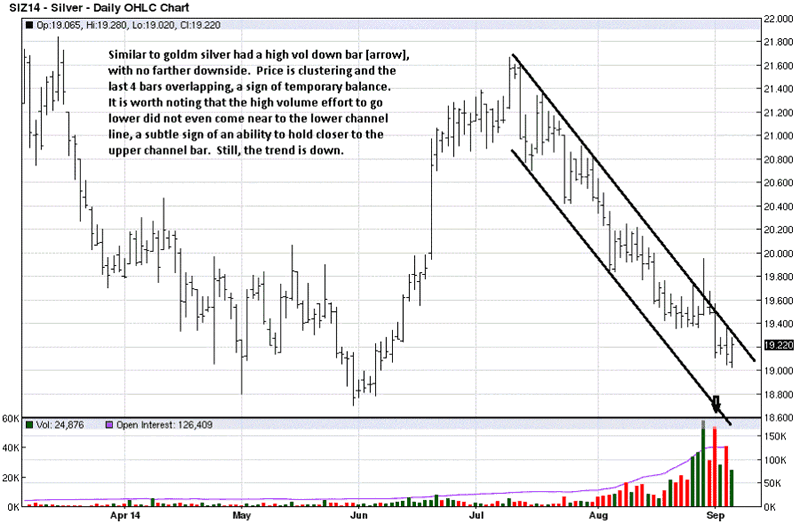 Unlike gold, note how daily silver is hugging the upper channel line, challenging what resistance there may be. Regardless, there are no strong reasons to be positioned from the long side in paper futures.